Hey beautiful people! How was your weekend? On Saturday, I attended a wedding ceremony after a few hours of work. I was extremely tired after work that all I wanted was to lay down and take a nap however, the wedding was too important . Despite being tired, I dressed up and headed to the wedding reception, which was great and beautiful. I got home around 12am. On Sunday after church, my friend Vera picked me up and we went to a gathering. We spent about two hours there before heading back to my place where we chatted late into the night. We were so engulfed in our conversation that we didn't realize how late it was ... definitely a fun evening and weekend. Pardon me if you have been seeing this Zara bag a lot. I can't help it as it fits everything I take with me. This bag is so big that it can fit a kid LOL! I carry a lot of junk in my bag. I hope you all had a wonderful weekend! If you don't mind sharing, what did you do? OMG Stella! The whole look is just so well put together, I am definitely inspired. Love every single detail from the Lady-like dress to those Miu Mius. Just like you I worked during the weekend and I spent some time with my family on Fathers Day. Isn't it the best when you can have long conversations with friends and lose track of time! It's the best. No pardon about the Zara bag, I'll wear it all the time too :) You look fab as usually. Love the dots and gingham prints! I love that you didn't use the same belt that came with the dress,you added your own twist to it! lol at the bag being able to contain a kid, accessories are beautiful as well as the shoes! Girl you need to tell us where you got those Miu Miu shoes cuz they are so pretty. You look beautiful . This outfit is absolutely beautiful. That ring is just georgeous! Love it! oh, my. i think i'm in love! i love it all, especially those shoes! Love the outfit and those shoes!! Fell in love when i saw them on Solange, they look great on u! Great get-up. Definitely one of the best match-ups I've seen so far. 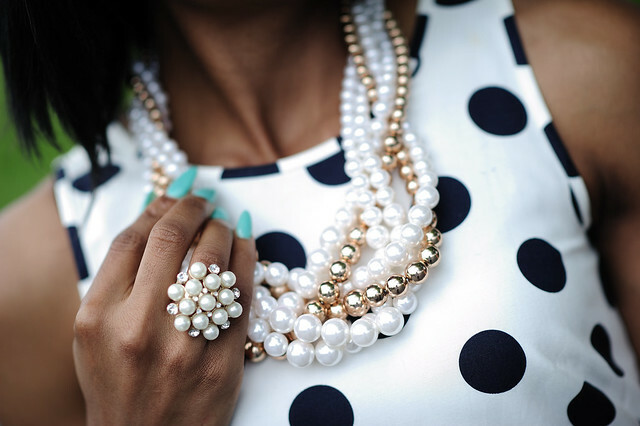 Polka dots, checkers, pearls...can't get any more classy. Elelegant look, aowww...def in love with this look. im in love with this look you look absolutely gorgeous!!! those shoessssssssssssssssssssssssssssssss!!!!!! So Lady Like! Love those shoes and that polks dot dress! What a great outfit! I love those shoes! Thanks for stopping by my blog today. Funmie, back off!!! I gat this. Lol. Nwa Ego, you look fab! I want something polka dotted too! Those shoes, I told you that day that I loved them. And yeah, the weekend was awesome!! Anywho, pretty dress and nice shoes. I also have like an everyday bag I stay using. It's big, it's sturdy, it's perfect. I don't care how many times it has appeared on my blog. lolol. That dress is gorgeous!!! LOVE the way it's shaped...hmmm...don't recall seeing that at JCrew...may have to pay a visit! Of course the shoes were perfect with this! I absolutely love this dress! Such a cute and classy look! I have a bag that holds everything so I know what you mean. You look so pretty, I love the mix of patterns with the polka dot dress and miu miu checkered pumps!!! This outfit is so pretty. I love the shoes the little check print is so perfect. Solange was literally JUST wearing those heels...wow! this look is perfection down to the details! Super cute look! Love your dress and mix of prints with your shoes!! love the mixing of prints! So glad to see you got your Miu Miu heels! They look great on you. I am currently dying to get a pair of studded Valentino heels and I just might splurge. OMG Stella. This look is phenomenal. I love those gingham heels! wow! your mix of gingham and polka dots is just perfect. those miu miu heels are absolutely perfect - i love the tie backs so much. and your accessories are just lovely. weddings are fun, but i always hate feeling rushed by them. a lot of the ones that are after work or make you drive far between places make me a bit nervous because i dont want to be late and mess something up! Pretty love how you mixed the prints!! Just a beauty and I loooooove the look, so classy and elegant! Have a great week Stella! Not to sound like a broken record, but I LOVE the shoes! You look gorgeous! Our weekend consisted of a day trip to Boston, where we went on a walking tour, went through Quincy Market, and got homemade gnocchi for dinner! This is my first visit to your blog but I can tell I'll be coming back! You look stunning, stunning, stunning! 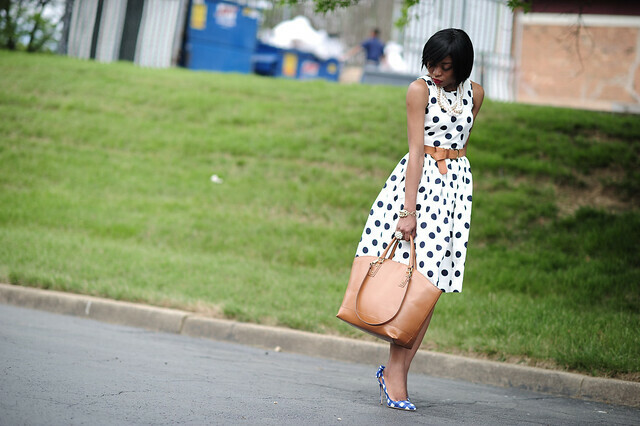 I love that polka dot dress and of course, those Mui Mui shoes-SOO JEALOUS! You look so beautiful!!! I absolutely love your polka dot dress & the shoes are just stunning!!! I would love for you to visit my blog sometime!! There's not an inkling of fatigue in these pics...you look amazing and I love those shoes and that dress! Rocking your fab shoes. love the look. 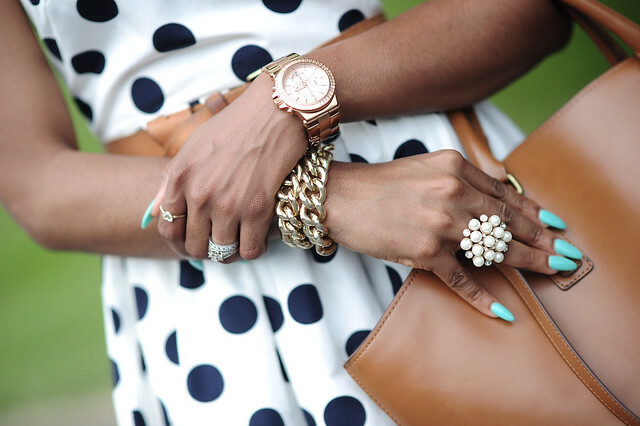 cute polka dot dress. it's your bag, you can wear it as much as you want to, sweetie. I fell in love with those shoes, if I were a girl, those shoes would be my favourite! I really love this dress, very nice!